AGGN senior fellow Shafiu Mohammed represented the network at various DAAD alumni events that have taken place in 2015/2016. Most of the events were organized within the university collaboration of Heidelberg University and Ahmadou Bello University (ABU). Shafiu Mohammed was trained in Public Health at Heidelberg University and is now working at ABU. He was co-facilitator or co-lecturer of the events and took the opportunity to inform the participants about AGGN. Some of the events were related to Good Governance in Public Health, others focused more on scientific methods and funding opportunities. 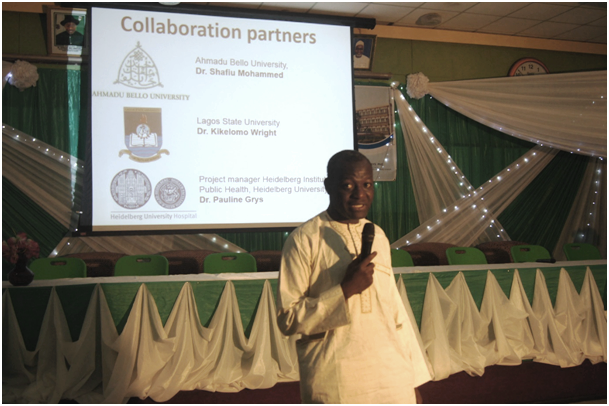 DAAD Alumni Expert Seminar “Improving capacities for public health services – Academic targets and networking” in Abuja, Nigeria, from November 27-30, 2015. Deutsche Welle reported on the event in their Haussa program: http://www.dw.com/ha/saurari-shirin-rana-na-dw-22122015/av-18934605. International Workshop on "Scientific Writing and publishing" at ABU in Zaria, Nigeria, December 2-5, 2015, for staff-in-training from strategically selected Departments in Sciences and Humanities. International Workshop on "Qualitative Methods in Health Research" at ABU in Zaria, Nigeria, May 20-25, 2015, for staff-in-training from strategically selected Departments in Sciences and Humanities. Presentation on "Scholarships and other Funding Opportunities: German Academic Exchange Service (DAAD)" for everybody interested. International DAAD alumni workshop on "Good Governance in Public Health" in Myanmar, February 16-20, 2016, for alumni of Heidelberg University Master program "International Public Health" . Shafiu presenting himself at Workshop on "Qualitative Methods in Health Research"